Marc Chagall was an early modernist painter who was born in 1887 in a small village in Russia called Vitebsk. He was raised in a devoutly Jewish environment with eight other siblings. Russia, like several other countries, looked down on Jews and treated them unfairly. In Russia at that time, Jewish children were not allowed to attend regular Russian schools or universities. Their movement within the city was also restricted. His mother managed to get him into a Russian high school by offering money to a headmaster. While at school, Chagall saw a student drawing and was fascinated, because he had never been around any art. He began copying images from books and loved it so much, he decided he wanted to become an artist. ​St. Petersburg was the center of Russia’s artistic life with its famous art schools. Since Jews were not permitted into the city without a special pass, he managed to get a temporary passport from a friend. He enrolled in a prestigious art school and studied there for two years. Chagall then moved to Paris to further his abilities. Although living in Paris, Chagall painted subjects and scenes from memories of his loved village of Vitebsk and his Jewish culture. Our painting of the week is I and the Village, an abstract painting which is like a dream about Chagall’s Jewish village life. During World War II, the Nazis of Germany stole and kept many pieces of classical or traditional art from the countries they overran. They disliked any modernist art, however, and definitely were against any Jewish artists, such as Chagall. Chagall was living in France during World War II, but the Nazis invaded that country. This put all Jewish people there in danger. A group of Americans ran a rescue operation smuggling artists and intellectuals out of Europe to the United States via forged visas. One of the men behind the rescue was Varian Fry. The library has a biography about Varian Fry and those rescue operations that was written by Arkansas author, Carla Killough McClafferty. Marc Chagall was one of more than 2,000 people who escaped from the Nazis to America thanks to those rescue efforts. Later, in 1943, Chagall learned that the Nazis had destroyed his beloved village of Vitebst. As part of a memorial book dedicated to eighty-four Jewish artists who were killed by the Nazis in France, Chagall wrote a poem entitled "For the Slaughtered Artists: 1950". Most of Chagall’s art possesses rich color and a happy tone but he painted two works during the time when the Nazis were in power that express the sorrow and abuse suffered by his Jewish people. These are "Solitude" and "White Crucifixion”. Chagall created his own mixture and style of modern art based on his idea of Eastern European Jewish folk culture. Most of his paintings are based on memories of his Jewish village. His paintings often contain figures floating in the sky, livestock, and fiddlers. Several of his paintings feature a bride and groom, a reflection of his marriage. It’s been said that Chagall’s colors sparkle with poetry, and throughout his career, it has been his colors which attracted and held the viewer’s attention. His paintings do not even attempt to imitate nature. Chagall’s pictures, he said, tell no stories: they portray only his thoughts and memories. Today, he is widely regarded as one of the most successful artists of the 20th century. Chagall’s I and the Village shows memories of his Jewish village. Within the painting, we can find goats, pastures, a farmer, a violinist, a church, and images of houses. In Chagall’s village, people and animals lived side by side, with a mutual need for each other. This need is shown in the painting by the line from the person to the cow that connects their eyes. The flowering plant symbolizes the tree of life, and it is the reward of the humans and animals working together. The large circular forms bring to mind the orbiting sun, moon, and earth. The painting shows an influence from an art style called Cubism. Cubism was an innovative art movement that broke subjects up into many different shapes and angles. The objects of I and the Village are different sizes and randomly placed on the canvas with some even being upside-down. The colors are bright. I and the Village illustrates the give and take between humans and the plants and animals surrounding them. Besides his paintings, Chagall was known for his murals and stained glass. He did stage design in Moscow and for the New York Ballet Theatre. He completed two murals for the New York Metropolitan Opera, The Triumph of Music and The Sources of Music. In 1963, Chagall was commissioned to paint the new ceiling for the Paris Opera House (one of our Places of the Week). However, some objected to his decorating the French national monument because he was a Russian Jew, and some objected because he was a modern artist. The final canvas was nearly 2,400 square feet and required 440 pounds of paint. Upon its completion, most agreed it was a wonderful addition to the Paris Opera. Chagall created a mosaic mural for the city of Chicago. The mosaic, Four Seasons, was a gift to the City of Chicago by an American banker. The mural is wrapped around four sides of a wide, 70 feet long rectangular box. A glass canopy protects the outdoor mosaic. With gratitude for Chicago and the Art Institute’s great support for his Four Seasons mural, Chagall offered to create a set of stained-glass windows for the museum. Chagall’s windows commemorate America’s bicentennial and celebrate the country’s cultural and religious freedom. One of Chagall's major contributions to art has been his work with stained glass. At the age of 70, he designed windows for a church in the French Alps, his first major project. 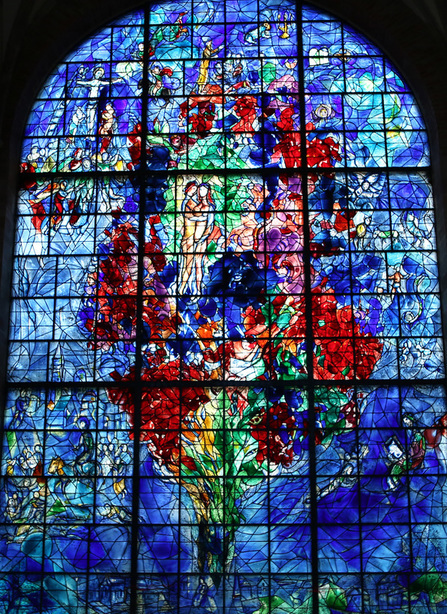 In 1964, Chagall created a stained-glass window, entitled "Peace", for the United Nations in memory of a UN secretary general, Dag Hammarskjold. Chagall also produced windows for a church in New York state, a cathedral in Switzerland, a church in Germany, a church in England, a cathedral and a chapel in France, and a synagogue in Israel. Chagall completed his last stained glass window for Chichester (Chy-chester) Cathedral in England at the age of 90.